A: Although we have addressed similar questions over the years, the earlier replies were based more on observation and personal interpretation than on official norms. Since those replies, the liturgy office of the U.S. bishops’ conference has published some guidelines that can clarify this situation even though they refer to multilingual rather than bilingual situations. The complete norms can be found at: http://www.usccb.org/prayer-and-worship/the-mass/frequently-asked-questions/guidelines-for-a-multilingual-celebration-of-mass.cfm. This document also considers that multilingual parishes provide for the needs for the spiritual needs of the faithful, and so multilingual Masses should be rare and used above all for occasions when the communities come together. Therefore, it does not take into account the situation of a lone priest who does not speak the second language. However, we present here some of these norms applicable to Mass. “1. The Introductory Rites — The introductory rites of Mass have as their purpose ‘to ensure that the faithful, who come together as one, establish communion and dispose themselves properly to listen to the Word of God and to celebrate the Eucharist worthily’ (GIRM, no. 46). Therefore, every effort should be made to create this disposition in those assembled. “a. The choice of processional music, introductory greetings and of music for the penitential intercessions and the Gloria can elicit an awareness of the cultural and linguistic diversity of those gathered for the liturgy. “b. The invitation to pray before the Collect can be given in the diverse languages spoken by those assembled. The Collect itself should be prayed in one language to preserve its integrity. “2. The Liturgy of the Word — “When the Sacred Scriptures are read in the Church, God himself speaks to his people, and Christ, present in his word, proclaims the Gospel. “‘Therefore, the readings from the Word of God are to be listened to reverently by everyone, for they are an element of the greatest importance in the Liturgy. Although in the readings from Sacred Scripture the Word of God is addressed to all people of whatever era and is understandable to them, a fuller understanding and a greater efficaciousness of the word is nevertheless fostered by a living commentary on the word, that is, by the Homily, as part of the liturgical action'” (GIRM, no. 29). 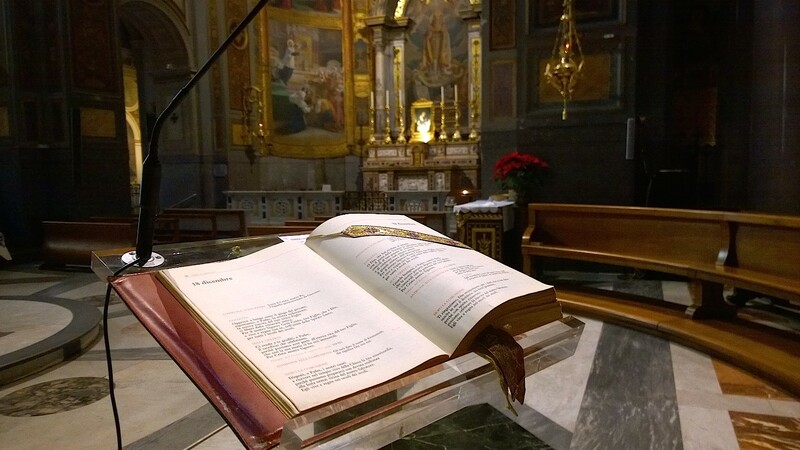 “In order that the Sacred Scriptures can be heard with reverence and understood by all, attention should be given to the language(s) in which they are proclaimed and commented upon in the homily. “a. One or both of the readings preceding the Gospel should be proclaimed in the language understood by the majority of those assembled. If two readings are to be proclaimed, one may be proclaimed in another language appropriate to those assembled. As a suggestion, since the first reading and the Gospel normally have similar themes, these could be proclaimed in different languages so that each group can hear at least some of the primary themes from the Sacred Scriptures of the day. “b. Printed booklets which provide translations of the Sacred Scripture readings have proved helpful and should be continued. Providing a brief commentary in these booklets could be effective, such as the one-sentence that the Lectionary itself provides. “c. In multilingual Masses the Responsorial Psalm may be divided into different languages, which could be an enriching experience. Including translation of the verses has proven effective. The language used would preferably (though not necessarily) be the same language as the first reading, since the Psalm in some way responds to it, and this would show the relationship more clearly. The refrain used with the Psalm should be the same language as the Psalm or multilingual. “d. The Gospel, which Christ himself proclaims, may be read in more than one language in its entirety…. At the conclusion of the proclamation in the first language, a minister should immediately proceed to the proclamation of the text in the next language. The conclusion is said only once and in the last language used. A well-crafted bilingual/multilingual Alleluia verse could be helpful. It is not recommended that the Gospel be broken into different sections for different languages. “e. The homily, ordinarily, should be preached in the language understood by the majority. A short summary may be given in other languages. The homilist may reflect the same theme in his summary while incorporating a different development or cultural illustration. “i. The invitation to each of the petitions could be given in the various languages understood by those assembled (e.g., ‘Let us pray for the Church’ and ‘Let us pray for the sick,’ etc.). Following each invitation, a silent pause will allow for the assembly to unite in prayer for particular concerns. The conclusion to each intercession could then be spoken or sung in the same language throughout to allow for the consistent, flowing pattern of the response among the assembled. “ii. Or, each petition could be said or sung in a different language, each with a common response, e.g., Kyrie eleison or Te rogamus audi nos or Domine, exaudi nos, etc. This would eliminate the repetitiousness of the invitation in several languages for each petition. “iii. Or, the first part of the petition could be given in one language and the second part (the assembly’s response) be given in another. “a. Preparation of the Gifts. ‘At the beginning of the Liturgy of the Eucharist the gifts which will become Christ’s Body and Blood are brought to the altar’ (GIRM, no. 73).These gifts of bread and wine, as well as gifts for the Church or the poor brought by the faithful or collected at Mass, are appropriate. “b. Eucharistic Prayer. To preserve the integrity of the Eucharistic Prayer, the whole of the Priest’s parts of the Prayer (from Preface through Doxology) should be in the same language. The acclamations proclaimed by the assembly could be either multilingual or in the language of the Eucharistic Prayer. “c. Communion Rite. Because the Lord’s Prayer is common to all Christians, members of the assembly may be invited to recite the prayer in his or her own language simultaneously with others. Otherwise, to preserve the integrity of the Communion Rite, it should be conducted in one language (different from that of the Eucharistic Prayer). The Agnus Dei acclamation could be either multilingual or in the language of the rest of the Communion Rite. In its third part the document offers valid norms for music including the recommendation of the assembly learning the most common Latin chants for the ordinary of the Mass and the use of songs that are known in several languages. In the particular case of our reader, the bulk of the Mass would be in English with some parts in Spanish. The above mentioned document appears to presume that the priest himself reads the summary of his homily and indeed this would be the best-case scenario. The zeal and effort made by many English-speaking priests in the United States to meet the pastoral needs of the growing Spanish-speaking population is truly admirable. However, learning a new language is never easy, and doing so when one is already advanced in life is yet more daunting and is not always feasible. These difficulties are often compounded by the fact that not all immigrants speak the same variety of Spanish. And there are even rural immigrants from countries such as Peru and Mexico for whom Spanish is not their first language. In spite of this difficulty, it is often possible to learn at least how to read the language correctly, and the best solution is that the priest read his prepared text. My experience with Spanish speakers is that they are almost universally grateful and edified when the minister makes the effort to speak in their language. They are also very tolerant and forgiving of errors and slip-ups. I do not think that having a layperson read out a translation of a homily is a viable solution. It is likely to cause confusion and leave the impression that the layperson is actually giving the homily itself, a practice which has been repeatedly prohibited. Also, a homily is more than just a text that is read; it is closer to a conversation, a personal communication in which the ordained minister explains God’s word and exhorts the faithful to live in accordance with what they have heard. Therefore, the personal element is very relevant to the efficacy of the communication itself. “Simultaneous translation maintains the original ‘communicative’ rapport of the pastor with his flock. My recent experience of this situation in the USA is that the level of English among the [Spanish-speaking] listeners is extremely diverse. Some will understand 100%, others 80%, 50%, etc. Those who have no knowledge of English have the live translation, and they can also perceive the personality of the priest in his intonations, facial expressions and gestures. It establishes a much more personal relationship than simply listening to a written text read to them. If an immediate simultaneous translation is not feasible, but it is possible for someone to translate the text of the homily ahead of time, then I believe that the best solution is that the priest preach the homily in English and after each paragraph or principal point, some other person read the translation, preferably using a different microphone.